When I saw this product, my eyes bulged with excitement. I yanked it off the shelf at my local Target, and began reading the description on the back of the bag. It mentioned eating these chips with guacamole. My heart sank a little. I was hoping they'd be truly sweet—the kind of item you wouldn't want to eat with guacamole. But then I looked at the ingredients and saw that the number one ingredient was still corn. "Sweet potato powder" was a good ways down the list. Although I was no longer so enthused about trying them, I decided to buy them anyway, since I like to try interesting new things. I had always been a fan of sweet potato French fries, but I'm appalled that anyone would eat them with non-sweet condiments. At a central Pennsylvania county fair growing up, I remember eating those fries with maple syrup and brown sugar, the way they were meant to be eaten—like a dessert. People in California butchered them with tartar sauce. Tartar sauce? On sweet potato fries? But anyway, these chips are a completely different animal. 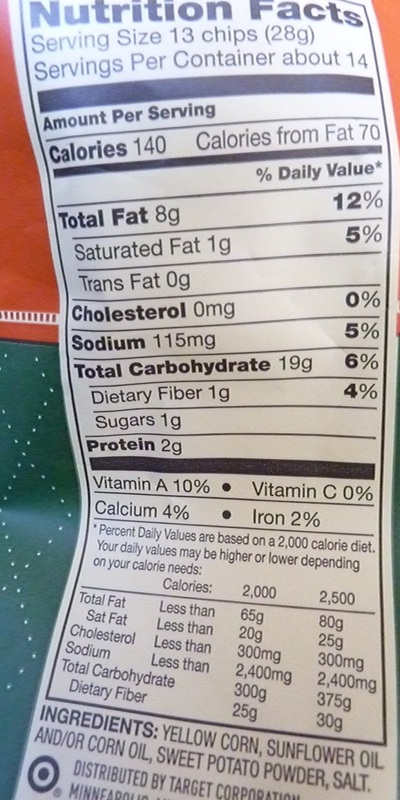 They're basically just regular tortilla chips with a tiny hint of sweet potato flavor. I don't particularly enjoy eating plain tortilla chips without any salsa, and likewise, I found these to be rather dull without some fixins. I didn't think hot salsa was a good pairing with them at all, though. My wife and I took Target's suggestion of guacamole to heart, and Sonia mashed up some avocados and tomatoes. It went pretty well with these chips, I must admit. And Sonia absolutely raved about these things even before she had them with guac. I don't think I would have given them more than a 6 if it hadn't been for Sonia and her homemade guacamole. But I could see how anyone might be a fan of these chips, as long as they're not expecting something particularly sweet. I give this product 7 out of 10 stars. I wasn't impressed with the Archer Farms sweet potato chips either. Trader Joe's has some really good sweet potato corn chips that taste more sweet potato like. It's worth giving them a shot, Noel...unless you like your sweet potato chips *sweet*. 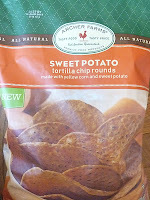 If you want really sweet potato-y chips try Food Should Taste Good Sweet Potato Tortilla Chips if you can find them. They are SO delicious (although, I do not do sweet on sweet - I love them with garlicky hummus). Thanks for the rec, J. What store(s) can you find Food Should Taste Good chips at? I've found them at Whole Foods. 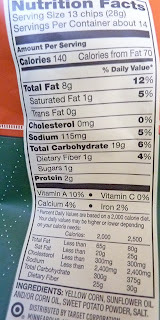 Thank Yooouuu so much for some very tasty(and lite on sodium) sweet potato chips!! Yeah, enaira, the ziploc is great!